It doesn't matter if you're working on a car, truck, ATV, or motorcycle—having an extensive collection of tools is vital to keeping your machinery in perfect shape. That's why this is one deal you really can't pass up if you can spare the cash. 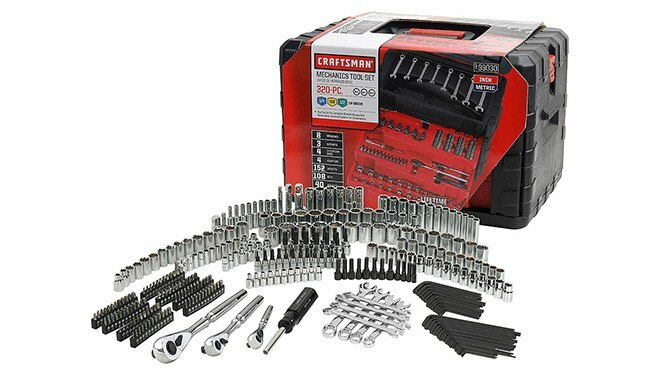 Sears is currently having a sale on a Craftsman 320-piece Mechanic's Tool Set, discounted from $359.99 to $129.99 for a $230.00 savings. This is likely one of the best deals you'll ever see on such a comprehensive package. Housed in a nice three-drawer case, this tool set includes quick-release ratchets in 1/4", 3/8", and 1/2" drives, 152 sockets (6, 8, and 12 socket points) in both inch and metric sizes, 4 extension bars, 8 combination wrenches, 12 nut drivers in inch and metric sizes, 96 screwdriver bits, as well as 40 hex keys with 4 adapters. So if you've been keeping an eye out on a real good deal on a tool set, you'll want to hop on this one right away. Sears is also offering free shipping on orders over $59, as well as free store pickup if a store has it in stock near you.